The team is contacted by Jakomo Sato, Assistant to the Second Foreign Minister for Trade on Fessor (2814 Foreven). He is seeking to hire experienced trouble-shooters to travel to Roopolaty (2712 Foreven) and determine the status of Deputy Third Foreign Minister for Trade, Stefana Kazlauskas. Kazlauskas has gone on holiday to Roopolaty, a balkanized world designated as an Amber Zone by the Travellers’ Aid Society due to internal political strife. Sato hastily explains that Kazlauskas had long been intent on touring the ruins of a long departed alien race in the Northern Uplands. He tried to convince her not to go but to no avail. In hushed tones Sato reveals that information obtained through diplomatic back channels suggests that an off world tourist or tourists are being held by militants in the vicinity of the ruins. Unable to prod the government of Fessor into formal action in a timely manner, he is turning to the characters for assistance. (If pressed he will reveal he has the covert backing of the Second Foreign Minister and his contingency accounts). Sato will provide roundtrip middle passage to and from Roopolaty, cover all reasonable expenses and pay Cr 10,000 per person to find Kazlauskas and return her safely home. He can’t promise more than that up front but thinks he can secure bonuses based on how successful the mission is. If Kazlauskas, or other Fessori, are being held for ransom, the team is authorized to negotiate for their release and is advised to coordinate with the local consulate. 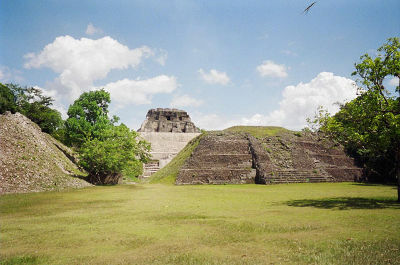 Roopolaty Ruins : Image from wikimedia. Creative Commons Attribution 2.0 Generic license. 1. While travel to Roopolaty itself is relatively straightforward, it takes a fair amount of negotiation/haggling to obtain the services of a local guide and secure the use of a surface vehicle to travel to the Northern Uplands. The trip takes three days, the last half of which is via unpaved roads. Sato’s information turns out to be flat wrong; Kazlauskas is in no danger and will in fact be quite put out that the characters have been sent to bring her home. 2. As in option number 1 except that the characters’ vehicle will come under attack by brigands two days out from the capital city. They are mainly intent on exacting a “toll” from the party and offer token violence at best unless one or more of their band is injured or killed, at which point the gloves come off. 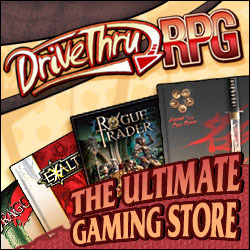 There are 1d6+2 brigands armed with auto rifles and possessing stats consisting of all 7’s. 3. Sato’s information was correct and Kazlauskas is being held for ransom by anti-government militants intent on embarrassing the local regime. The militants’ base of operations is an outpost about 5 km from the ruins that supports approximately 30 persons, most variously armed with assault weapons. They seek kCr 100 in ransom and want the incident publicized as widely as possible, all the better if the off world news services pick up the story. The militants are not die-hard fanatics but they will put up a strong fight if challenged. 4. As in option number 3 but the militants have vowed to overthrow the government by any means possible. They have taken Kazlauskas, as well as a handful of other tourists, hoping to exchange them for political prisoners being held in the capital. It’s possible that a sufficiently skilled negotiator could secure their release in exchange for a cash ransom but it will take some effort. A military style raid might also work but the hostages will clearly be at risk. 5. In reality Kazlauskas works for Fessor’s intelligence service and was sent to Roopolaty in the guise of a tourist for the express purpose of meeting with the anti-government militants to arrange support for them. Sato, who is Kazlauskas’ handler, obtained information that the Zhodani were aware of her mission and hired the player characters to extract her before she could be compromised. (Sato gives the team an innocuous sounding message to pass to Kazlauskas informing her that her cover has been blown). Whether or not there are actually any Zhodani agents in the area and what their skills/talents are is left to the referee to decide. 6. As in option number 5 except that Kazlauskas was unwittingly sent to Roopolaty by Sato in hopes of triggering an interstellar incident as a pretext for intervention by Fessor. Word of her mission was leaked to the Zhodani though obscure channels, in theory insuring that she would be discovered. Things have not gone as planned as Kazlauskas has apparently been very successful in her mission to contact the militants. Sato, much dismayed at the situation, hired the team in hopes that the plan will work on the second pass. In the interest of plausible deniability, the Zhodani have dispatched their own group of hired travelers to investigate the situation with orders to secure any off-worlders found for questioning (and likely later disposal). The group while on Wutubole (Pieplow/0819) are contacted by a salvage company to deliver a hold of supplies to Belt Maginum (Anika/1218) for Cr 200,000. The J-2 route takes them through the Zhodani Consulate. They are advised to skim gas giants and use water in the absence of gas to avoid contact with the Zhodani officials as much as possible. 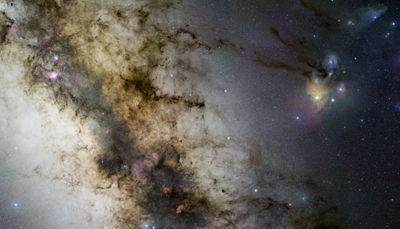 Milky Way, seen from the Foreven Sector : Picture from wikimedia. Creative Commons Attribution 3.0 Unported license. 1. The captain and/or any ex-Scouts in the group are advised this is a cover. They need drop a load of probes in each system. These probes will check each system for a lost Scout Cruiser that misjumped and vanished some months previously. They are stored in the cargo and another ship will collect the telemetry some months in the future. 2. 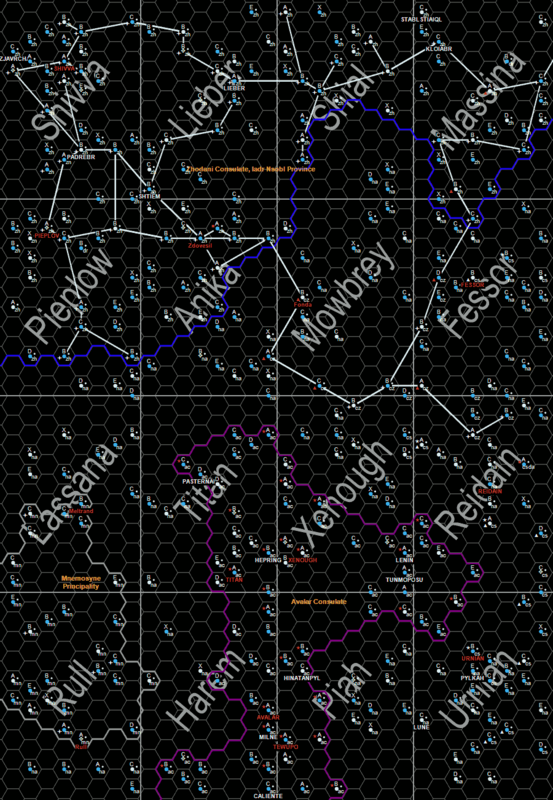 As above but in Clamp (Anika/1317) system the players arrive on the very edge of the system and sensors show dead a ship nearby. A large blocky ship of Hiver origin. The cargo bay is open and an exploration team will find 3 low berths smashed into a corner by open hatch as well as some yellow painted metal parts similar to open frame cargo haulers used on space stations and belter ops. The Hiver crew are dead throughout the ship. There are two dead humans aboard in vacc suits one has standard helmet, the other a Zhodani clamshell on deck near them. The non-Zhodani corpse has a dead chronometer indicating date is 1199 Imperial. Dated articles in their staterooms are about a year old. 3. As above but one low berth is on battery power. If opened safely a young lady named Mei Ling is recovered. She was a steward on a large passenger/freighter liner en route from the far Imperium to the Consulate via Fessor. She states the ship was jacked by a large group of men who gassed the passengers and packed them into the low berths they had in cargo bay of liner. After being forced to assist she was put in a berth too. The men were mixed race humans. 4. As above, when the ship lands to water they are contacted by Miriya a deep cover agent of the IISS and Hiver expert from the Rim. She is the only survivor of the liners’ passengers who were lost in the crash of the cargo sled. She was rescued by a Traveller who witnessed the landing in the hills. She is an expert Gunner and will request working passage. She keeps her IISS ID secret. 5. As above. On arrival in Belt Maginum they deliver the cargo and are paid by the contracted factor there. He advises that Miriya and Mei Lings’ ship left some days ago and picked up cargo and no passengers as was booked full, rare coming from the Consulate. There is an archeologist and a Universal Exports agent needing passage to Fessor at double rates. 6. As above, on arrival at Fessor the missing starship is in port. Mei Ling and Miriya would find no familiar crew and a look at passenger/crew list would tell both are still aboard. The crew and most passengers tend to be tall and swarthy. The Hiver ship were just used by the Zhodani to move the passengers into storage. But a misjump (temporal) accident destroyed the Hiver ship, the instant aging is why two human corpses appear aged. The crew were taken to a camp for holding. The hijackers were plain pirates. The liner is being used to infiltrate agents into the Imperium. Traveller5 data added to the Foreven page. Files edited by Reaver. 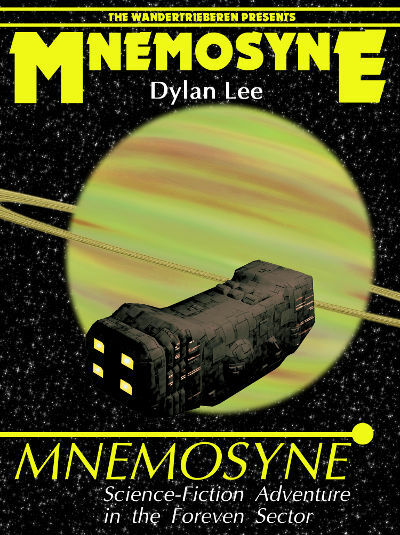 Mnemosyne Sourcebook by Dylan Lee has been added to the free pdf-files page. 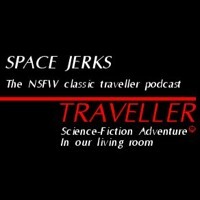 Space Jerks has started a new Traveller podcast. They are playing the Traveller Adventure. Gvurrdon Sector Campaignbook by Roger Malmstein has been added to the free pdf-files page.